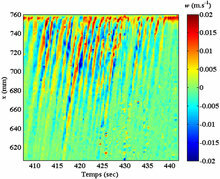 The present paper provides the first experimental investigation of an oscillating acoustic streaming jet. The observations are performed in the far field of a 2 MHz circular plane ultrasound transducer introduced in a rectangular cavity filled with water. Measurements are made by Particle Image Velocimetry (PIV) in horizontal and vertical planes near the end of the cavity. Oscillations of the jet appear in this zone, for a sufficiently high Reynolds number, as an intermittent phenomenon on an otherwise straight jet fluctuating in intensity. The observed perturbation pattern is similar to that of former theoretical studies. This intermittently oscillatory behavior is the first step to the transition to turbulence.